What if I had a blog? Install compiz and plugins. For a while, I wasn't getting any window decorations at all until I discovered that I needed to enable the "Copy to texture" plugin. Install Emerald. I used these instructions since it's not in the Ubuntu repositories any more. Open Emerald Theme Manager and select your theme. Still in Emerald Theme Manager, under "Emerald Settings", uncheck "Use Decoration Cropping". Edit ~/.emerald/theme/theme.ini in a text editor, and locate the [buttons] section. Adjust the horizontal_offset and vertical_offset to negative values. The appropriate values depend on the theme. For the Rezlooks-Graphite theme, I found that it would work with horizontal_offset=-3 and vertical_offset=0. Restart Emerald and adjust your values if needed to shift the buttons as close to the corner of the screen as possible. Note that you must re-apply your changes to theme.ini if you open Emerald Theme Manager again. tl;dr: Install the hotkey drivers. I noticed soon after installing Windows 7 on my new laptop (Eurocom Shark 4) that I was sometimes getting no sound from my headphones. The Realtek control panel faithfully reported that the jack was connected, and muted the speakers as expected, yet no sound could be heard through the headphones. I experienced this problem on both Windows and Linux (Ubuntu 14.04), so I assumed it was a hardware or firmware problem. However, after a bunch of futile Googling and tinkering, I noticed a pattern - it always worked on a clean boot, but not after resuming from sleep mode. This led me to refine my search terms, bringing me to this discussion. It turns out that the headphone jack needs to be reinitialized after system resume, and (for some reason I cannot fathom) the hotkey drivers are responsible for doing this! I had not installed the hotkey drivers because Windows responded to most hotkeys out of the box. But sure enough, after installing the manufacturer's hotkey driver, the headphone problem was resolved. This might work for other Clevo laptops too. So if Google has sent you to this page, I hope it helps. These are my notes on installing Windows 7 on the Eurocom Shark 4 (Clevo N150SD). Setup will prompt you to load a USB driver. Select Intel(R) USB 3.0 Root Hub if it shows up. If the only choice is the eXtensible Host Controller, choose that instead, ignore the error, then try browsing again and hope the correct option shows up. I don't know why this works. These lists are organized to match the driver DVD. When possible, I prefer to install from Device Manager to avoid the extra junk that the installers sometimes bundle. Hotkeys - install from disk, otherwise the headphone jack will not work after a system resume. See this discussion for more details and a possible workaround on Linux. Audio - install from disk. Fingerprint - Only install from disk if you plan on using it. Installs background services. Sound Blaster Cinema - Don't know what it does, skipped. Intel wifi direct - Don't need it, skipped. This post is for me to look back on later and remember how to fix this! After some trial and error, the fix: in CompizConfig Settings Manager, OpenGL plugin, uncheck "Framebuffer object". I can't figure this out, and I don't think I'm a robot. It has recently come to my attention that the server that runs this website was vulnerable to attacks exploiting the recently-discovered Heartbleed bug. If anyone managed to abscond with any of my passwords, keys, or other sensitive information, please return these items to brad@bgreco.net at your earliest convenience. Thank you. Someone made a video and blog post of a little tweak I wrote for Google Maps on Android. Neat. They are awesome. A coworker ordered a whole bunch of them for $2 each so now I have one. Let the fun begin. Deplane - It amuses me, for some reason, that we have a dedicated word for the act of getting off of an aircraft. Rubbish bin - Far superior to "garbage can". Must be pronounced with a British accent. Valchives - Definition: those little stringy things you find inside oranges and other citrus fruit. Trust me. When I added a simple comment system to this blog, I intentionally did not include a CAPTCHA mechanism. I assumed (well, hoped) that this blog is both obscure and custom enough that it would be largely ignored by comment-spammers. So, now there is an extra are-you-human check when you go to submit a comment. It's not the traditional "try to decode these symbols that vaguely look like letters if you squint really hard" CAPTCHA, since nobody likes those. Hopefully it will be sufficient to deter the bots, at least. You might recall, gentle reader, that I once predicted that there would never be any comments on this blog. The reasons I gave were twofold: nobody actually reads this blog, and there is no mechanism in place by which my hypothetical loyal readers could leave comments. 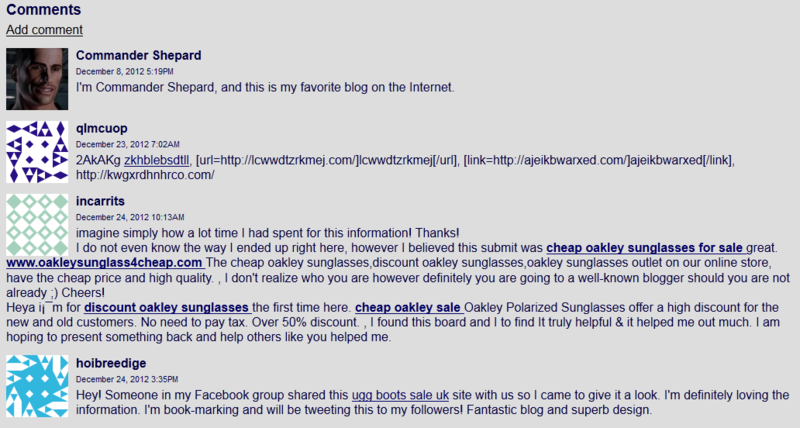 To test the comment system, I have asked an acquaintance of mine to give this blog his endorsement. Unsurprisingly, he was more than willing to oblige. As you may or may not know, my initials are BAG. My parents insist that this was not intentional, but I know better. As I was contemplating initials that are also English words, I realized that, if I replaced my middle initial with any other vowel, its status as an English word would remain unchanged: BAG, BEG, BIG, BOG, BUG. Well, that's cool, I said to myself. But just how lucky am I? That is, out of the 21� = 441 distinct consonant pairs, how many will form a valid English word when each of the five vowels is placed between them? We will consider the letter Y to always be a consonant. Only 7 consonant pairs, or 1.6% of all consonant pairs, have the every-vowel-makes-a-word property according to Word. Even 7 is generous, as there are a few words that it claims are valid that I don't agree with. Person A: "I'm using the Force to update the name of this sysif." Person B: "You can't just use the Force to do that!" For some inexplicable reason¹, BioWare decided to not include support for the mouse wheel when scrolling through menus in Mass Effect 2. Here's an AutoHotkey script that will partially enable mouse wheel scrolling. It works when scrolling through menu entries (Journal, Codex, etc). It does not work scrolling text boxes, such as the details that appear when you select a Codex entry. A pity, but it's better than nothing. Google's search bar is quite versatile. Besides returning (usually) relevant content from all over the Internet, it can act as a calculator, give you your public IP address, and perform unit conversions. For example, how many megabytes are in a terabyte? I suppose there's not really a standard unit for measuring data per volume. Myself, I prefer to measure it in Libraries of Congress per bushel. GOOD QUESTION! Let's find out. Why? I'm not too sure myself. I'm not foreseeing myself stunning the internet with my brilliant, insightful comments on current events or offering sage yet witty advice that will leave the masses hanging on to my every word. In fact, your guess as to what (if anything) will end up here is as good as mine! Prediction: After the initial flurry trickle of posts, there will be approximately one post every four months. Prediction: Each post will get precisely zero comments, for two reasons: (a) not many people will stumble across this little corner of the web (and if you're one of them, I would advise escaping as quickly as possible while you still can), but mostly because (b) I haven't coded a comment system.